Lately I have been suffering from RookieBrain, which is what happens when I spend too many hours at a time on the Rookie Magazine website (for “research” purposes of course…I’m still working on my Creative Nonfiction piece) and then end up feeling panicked and lonely and weird. There are so many references I don’t recognize and too too too many links (to be fair, Rookie doesn’t actually have a lot of links…I just feel an over-dramatic sense of darkness after clicking on too many [i.e. 1-2] links. I call this more general condition InternetBrain… or “I JUST WANT TO STAY HERE IN THIS ONE PLACE OKAY?”). Also, I constantly wonder how these girls possibly have the energy to do everything they are doing, and why I, made of similar human stuff as them, can’t be more productive. This is a normal frustration, I think, and writing my Creative Nonfiction piece has really helped me feel like I’m not just drowning in my own passivity. I found another partial remedy to RookieBrain: I’ve been submitting things to them! I have never ever been the type to “stick my neck out” (frankly that just seems like a stupid thing to do physically speaking), but something about sending an informal e-mail to a bunch of nice girls just seems easy. And the best part of submitting isn’t waiting to see if I accepted (I’ve already gotten one rejection from them and it wasn’t that bad! ); it’s more the feeling like I am playing a teeny tiny role in this thing I have been immersing myself in for the past few months–this thing that feels so intimidating, and so “other.” It’s kind of like voting…you know your vote doesn’t technically make a difference, but it’s still empowering to participate in what’s going on. Bad analogy? Okay. Anyway, clearly I have lots of THOUGHTS and FEELINGS about this whole Rookie thing, so I am actually thinking about turning it into my Senior Thesis project for next semester. Unrelatedly (actually, totally related but in ways not worth explaining), I am reading Marilynne Robinson’s Housekeeping for class right now and it is becoming one of my favorite books of all time. I don’t want to write about it yet because it’s too beautiful and sad (read: heart-cracking) and I am still in the middle of it. But today I got together with two of my friends from class who happen to be art majors (my favorite type of people), and we walked around in the rain talking about things that go with the book in our minds–photographs and songs and poems and letters. It was the best kind of afternoon, because people are infinitely better than the Internet. P.S. The other night/early morning I woke up to the creature below–fully wrapped in the blanket–whispering my name from the doorway…the first of what now has become a series of bizarre attempts by my roommate to “scare” me. She has enlisted everyone from her boyfriend to our other housemates as accomplices, but has yet to succeed. Pretty pathetic, seeing as I am a wimp. This weekend I got to meet one of my favorite person-that-I-don’t-actually-know’s. (I would say “celebrity” but I’m a little unclear on the criteria for such a title). I found out on Thursday night via social media that Tavi Gevinson (blogger, founder/editor of Rookie Magazine, brilliant 16 yr. old fashionista) was doing events in L.A. all weekend, and I nearly pulled out all my hair in excitement. The three events I went to–a book signing, a Best Coast Concert hosted by Rookie, and a comedy night at Upright Citizen’s Brigade**–were all pretty energy-sucking. Tavi was really, really sweet, but I couldn’t help but be majorly intimidated all weekend long. A lot of the intimidation was a result of my imagination, but some of it was because I was surrounded by cool kids (and I don’t mean this sarcastically). One thing that has made my project so stretching and rewarding so far is the fact that I have little in common with the average Rookie reader (or, at the very least, the average Rookie writer [there are about 60 girls & women on staff]). A lot of my pre-suppositions about meaning and about how to make decisions don’t match Rookie’s, but I support the magazine because I think it creates a forum for teenage girls to think and talk about things beyond finding the perfect date-night dress, things like politics and gender and social justice. That said, I felt pretty out of place. But I think that feeling is a pretty universal one, and, lucky for me, writeaboutable (as my Creative Nonfiction professor would say). 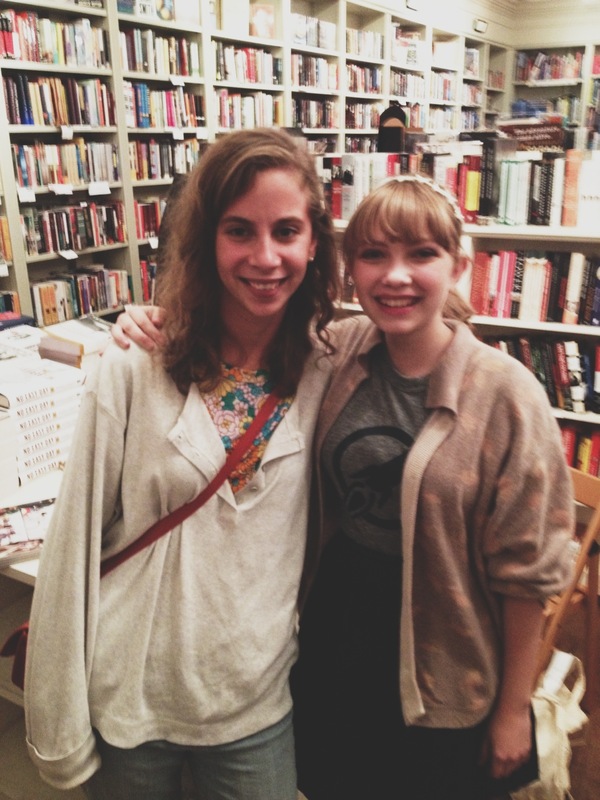 Also, Tavi said she liked my shirt and that’s all that matters. *this “decision” was also pretty much an emotional necessity, as it took everything into me just to talk to Tavi simply as me, a girl who wanted her book signed.